We just got done talking about the 2012 Claude “I’m a Bad Mutha’” Lecouteux’s “A Lapidary of Sacred Stones”. 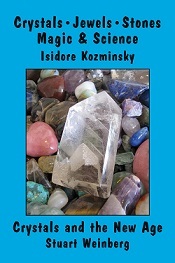 Now we’re going to talk about a reprint of Isidore Kozminsky’s 1922 “Crystals, Jewels, Stones: Magic & Science”, along with what the publisher calls a “preface” but it’s more like a mini book called “Crystals and the New Age” by Stuart Weinberg. What will 1922 Kozminsky be like versus Lecouteux’s 2012 Medieval lapidary? You’ll have to wait to find out because we’re starting with Stuart Weinberg’s “Crystals and the New Age”. Stuart Weinberg is in a unique position to write about crystals, gems, and minerals. He’s the owner of Seven Stars Bookstore in Cambridge, MA and from the photos provided in the book, Weinberg carries an insane selection of crystals and precious stones. Sadly, I’ve never had the chance to shop there, but it is probably a good thing for my checking account. What’s he’s written is a perfect introduction, not just to Kozminsky’s work, but to the crystal oriented New Age in general. Weinberg gives you an excellent and efficient introduction to chakras, astrology, and the role crystals can play in them. Then when he gets to channeling you’re given a rundown on Emanuel Swedenborg, Helena Blavatsky, Alice Bailey, Edgar Cayce, and Jane Roberts and Seth. Weinberg wraps things up with a little history of crystals themselves within the New Age movement. How the movement effected the availability of precious stones, what became popular when and how. A topic I feel confident Weinberg can speak expertly on. In fact, I would have loved for that section to have been longer. Could there be a solo Weinberg crystal book in the future? If so, more history on the retail of stones please! Now it’s time to take a look in the past to see what Isidore Kozminsky felt should go in his book of “Crystals, Jewels, Stones: Magic & Science”. Kozminsky opens explaining that a sincere attempt has been made to blend modern science with ancient occult philosophies. Obviously this is intriguing to the modern reader because the “modern science” in question is from 1922. Part One is “Crystal and Stones in the Bible and World Mythology”. It’s in here that he discusses “The Most Ancient Science” astrology, the Breastplate of Judgment (which is the rewarding topic of most of the chapters of part one), and stones in mythology. One chapter titled “The Greatest Charms in the World” is about the scarab. As a lady with earrings with scarabs carved into them, I will totally take “The Greatest Charm in the World” title. But enough about the opening act, you totally want to hear “Part Two: Precious and Semi-Precious Gems Arranged in Alphabetical Order”. Just like I did with Lecouteux’s lapidary, I’m going to look up emerald in Kozminsky’s book. When I do, I’m told to see Beryl. Once I’m at Beryl, listed clearly underneath is Emerald. It gives me loads of alternate spellings and mentions that one of its derivations is through the Latin Smaragdus. (Readers will remember that Emerald was listed under Smaragdus in Lecouteux’s “A Lapidary of Sacred Stones”.) The entry also lists a few emeralds that are notable for their size. Sadly, it’s not very exciting of an entry compared to Lecouteux’s lapidary, but that’s just because I chose Emerald. Diamond has a wealth of intriguing stories as well as factual information. Here we are at the end. Both books read, both books reviewed. Neither one is better than the other because they both have different things to offer, which I hope my reviews did a little bit to highlight. Sadly, when it comes to the land of studying crystals and precious stones, one really can’t have too many reference books. And I’m not just saying that to make the publishers happy. If you were starting your collection you wouldn’t do too bad having these two books on the shelf.